In 2007, several surveys showed that the green bar display generated instant positive reactions for 75% of internet users,a 15% raise of the purchase intentions and a 15% decrease in the abandonment of the purchase process. Depending on your needs or your technical pool,you may need to install your certificate on several machines. Some certificates are sold to be installed on a unique machine (physical or virtual).The additionnal licence makes then possible to duplicate an existing certificate instead of buying a new one for each different machine you may use. GlobalSign's certificates evolve and are now sold with unlimited machines licenses. 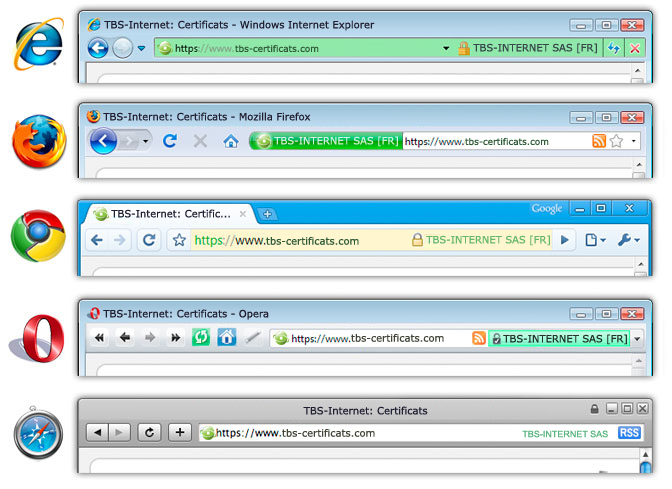 So, install your certificates on as much machines as you need for the price of one product ! It is then possible to secure other domains by purchasing additionnal SANs instead of buying a new certificate for each extra domain.